It is time for a FIRST Wild Card Tour book review! You never know if the book will be fiction, non~fiction, for young, or for old...or for somewhere in between! Enjoy your peek into the book! Best-selling Christian fiction writers have teamed together to contribute articles on the craft of writing. 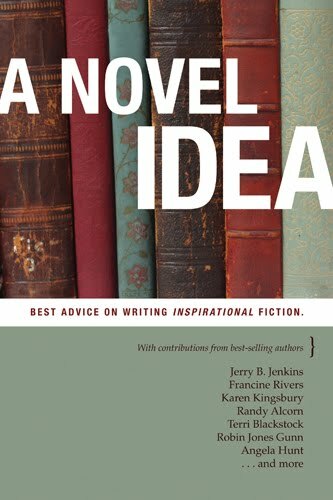 A Novel Idea contains tips on brainstorming ideas and crafting and marketing a novel. It explains what makes a Christian novel “Christian” and offers tips on how to approach tough topics. Contributors include Jerry B. Jenkins, Karen Kingsbury, Francine Rivers, Angela Hunt, and many other beloved authors. All proceeds will benefit MAI, an organization that teaches writing internationally to help provide literature that is culturally relevant. Imagine, if you will, that you and I are sitting in a room with one hundred other authors. If you were to ask each person present to describe their plotting process, you’d probably get a hundred different answers. Writers’ methods vary according to their personalities, and we are all different. Mentally. Emotionally. Physically. If, however, those one hundred novelists were to pass behind an X-ray machine, you’d discover that we all possess remarkably similar skeletons. Beneath our disguising skin, hair, and clothing, our skeletons are pretty much identical. In the same way, though writers vary in their methods, good stories are composed of remarkably comparable skeletons. Stories with “good bones” can be found in picture books and novels, plays and films. Many fine writers tend to carefully outline their plots before they begin the first chapter. On the other hand, some novelists describe themselves as “seat-of-the-pants” writers. But when the story is finished, a seat-of-the-pants novel will (or should!) contain the same elements as a carefully plotted book. Why? Because whether you plan it from the beginning or find it at the end, novels need structure beneath the story. After mulling several plot designs and boiling them down to their basic elements, I developed what I call the “plot skeleton.” It combines the spontaneity of seat-of-the-pants writing with the discipline of an outline. It requires a writer to know where he’s going, but it leaves room for lots of discovery on the journey. When I sit down to plan a new book, the first thing I do is sketch my smiling little skeleton. To illustrate the plot skeleton in this article, I’m going to refer frequently to The Wizard of Oz and a lovely foreign film you may never have seen, Mostly Martha. The skull represents the main character, the protagonist. A lot of beginning novelists have a hard time deciding who the main character is, so settle that question right away. Even in an ensemble cast, one character should be featured more than the others. Your readers want to place themselves into your story world, and it’s helpful if you can give them a sympathetic character to whom they can relate. Ask yourself, “Whose story is this?” That is your protagonist. This main character should have two needs or problems—one obvious, one hidden—which I represent by two yawning eye sockets. Here’s a tip: Hidden needs, which usually involve basic human emotions, are often solved or met by the end of the story. They are at the center of the protagonist’s “inner journey,” or character change, while the “outer journey” is concerned with the main events of the plot. Hidden needs often arise from wounds in a character’s past. Consider The Wizard of Oz. At the beginning of the film, Dorothy needs to save her dog from Miss Gulch, who has arrived to take Toto because he bit her scrawny leg—a very straightforward and obvious problem. Dorothy’s hidden need is depicted but not directly emphasized when she stands by the pigpen and sings “Somewhere Over the Rainbow.” Do children live with Uncle Henry and Aunt Em if all is fine with Mom and Dad? No. Though we are not told what happened to Dorothy’s parents, it’s clear that something has splintered her family and Dorothy’s unhappy. Her hidden need, the object of her inner journey, is to find a place to call home. “Because,” she answers, “my boss will fire me if I don’t go to therapy.” Ah—obvious problem at work with the boss. Immediately we also know that Martha is high-strung. She is precise and politely controlling in her kitchen. This woman lives for food, but though she assures us in a voice-over that all a cook needs for a perfectly lovely dinner is “fish and sauce,” we see her venture downstairs to ask her new neighbor if he’d like to join her for dinner. He can’t, but we become aware that Martha needs company. She needs love in her life. Usually the first few chapters of a novel are involved with the business of establishing the protagonist in a specific time and place, his world, his needs, and his personality. The story doesn’t kick into gear, though, until you move from the skull to the spine, a connection known as the inciting incident. Writers are often told to begin the story in medias res, or in the middle of the action. This is not the same as the Big Incident. Save the big event for a few chapters in, after you’ve given us some time to know and understand your character’s needs. Begin your story with an obvious problem—some action that shows how your character copes. In the first fifth of the story we learn that Dorothy loves Toto passionately and that Martha is a perfectionist chef. Yes, start in the middle of something active, but hold off on the big event for a while. Let us get to know your character first . . . because we won’t gasp about their dilemma until we know them. In a picture book, the inciting incident is often signaled by two words: One day . . . Those two words are a natural way to move from setting the stage to the action. As you plot your novel, ask yourself, “One day, what happens to move my main character into the action of the story?” Your answer will be your inciting incident, the key that turns your story engine. After Dorothy ran away, if she’d made it home to Uncle Henry and Aunt Em without incident, there would have been no story. The inciting incident? When the tornado picks Dorothy up and drops her, with her house, in the land of Oz. The inciting incident in Mostly Martha is signaled by a ringing telephone. When Martha takes the call, she learns that her sister, who was a single mother to an eight-year-old girl, has been killed in an auto accident. Think of your favorite stories—how many feature a hero who’s reluctant to enter the special world? Often—but not always—your protagonist doesn’t want to go where the inciting incident is pushing him or her. Obviously, Martha doesn’t want to hear that her sister is dead, and she certainly doesn’t want to be a mother. She takes Lina, her niece, and offers to cook for her (her way of showing love), but Lina wants her mother, not gourmet food. Even if your protagonist has actively pursued a change, he or she may have moments of doubt as the entrance to the special world looms ahead. When your character retreats or doubts or refuses to leave the ordinary world, another character should step in to provide encouragement, advice, information, or a special tool. This will help your main character overcome those last-minute doubts and establish the next part of the skeleton: the goal. At some point after the inciting incident, your character will establish and state a goal. Shortly after stepping out of her transplanted house, Dorothy looks around Oz and wails, “I want to go back to Kansas!” She’s been transported over the rainbow, but she prefers the tried and true to the unfamiliar and strange. In order to go home, she’ll have to visit the wizard in the Emerald City. As she tries to meet an ever-shifting set of subordinate goals (follow the yellow brick road; overcome the poppies; get in to see the wizard; bring back a broomstick), her main goal keeps viewers glued to the screen. This overriding concern—will she or won’t she make it home?—is known as the dramatic question. The dramatic question in every murder mystery is, Who committed the crime? The dramatic question in nearly every thriller is, Who will win the inevitable showdown between the hero and the villain? Along the way readers will worry about the subgoals (Will the villain kill his hostage? Will the hero figure out the clues? ), but the dramatic question keeps them reading until the last page. Tip: To keep the reader involved, the dramatic question should be directly related to the character’s ultimate goal. Martha finds herself trying to care for a grieving eight-year-old who doesn’t want another mother. So Martha promises to track down the girl’s father, who lives in Italy. She knows only that his name is Giuseppe, but she’s determined to find him. Even my youngest students understand that a protagonist who accomplishes everything he or she attempts is a colorless character. As another friend of mine is fond of pointing out, as we tackle the mountain of life, it’s the bumps we climb on! If you’re diagramming, sketch at least three curving ribs over your spine. These represent the complications that must arise to prevent your protagonist from reaching his goal. Why at least three ribs? Because even in the shortest of stories—in a picture book, for instance—three complications work better than two or four. I don’t know why three gives us such a feeling of completion, but it does. Maybe it’s because God is a Trinity and we’re hardwired to appreciate that number. While a short story will have only three complications, a movie or novel may have hundreds. Complications can range from the mundane—John can’t find a pencil to write down Sarah’s number—to life-shattering. As you write down possible complications that could stand between your character and his ultimate goal, place the more serious problems at the bottom of the list. The stakes—what your protagonist is risking—should increase in significance as the story progresses. In Mostly Martha, the complications center on this uptight woman’s ability to care for a child. Lina hates her babysitter, so Martha has to take Lina to work with her. But the late hours take their toll, and Lina is often late for school. Furthermore, Lina keeps refusing to eat anything Martha cooks for her. I asked you to make the ribs curve because any character that runs into complication after complication without any breathing space is going to be a weary character . . . and you’ll weary your reader with this frenetic pace. One of the keys to good pacing is to alternate your plot complications with rewards. Like a pendulum that swings on an arc, let your character relax, if only briefly, between disasters. Along the spiraling yellow brick road, Dorothy soon reaches an intersection (a complication). Fortunately, a friendly scarecrow is willing to help (a reward). They haven’t gone far before Dorothy becomes hungry (a complication). The scarecrow spots an apple orchard ahead (a reward). These apple trees, however, resent being picked (a complication), but the clever scarecrow taunts them until they begin to throw fruit at the hungry travelers (a reward). See how it works? Every problem is followed by a reward that matches the seriousness of the complication. Let’s fast-forward to the scene where the balloon takes off without Dorothy. This is a severe complication—so severe it deserves a title of its own: the bleakest moment. This is the final rib in the rib cage, the moment when all hope is lost for your protagonist. At the bleakest moment, your character needs help, but be careful how you deliver it. The ancient Greek playwrights had actors representing the Greek gods literally descend from the structure above to bring their complicated plot knots to a satisfying conclusion. This sort of resolution is frowned upon in modern literature. Called deus ex machina (literally “god from the machine”), this device employs some unexpected and improbable incident to bring victory or success. If you find yourself whipping up a coincidence or a miracle after the bleakest moment, chances are you’ve employed deus ex machina. Back up and try again, please. Avoid using deus ex machina by sending two types of help: external and internal. Your character obviously needs help from outside; if he could solve the problem alone, he would have done it long before the bleakest moment. Having him conveniently remember something or stumble across a hidden resource smacks of coincidence and will leave your reader feeling resentful and cheated. So send in the cavalry, but remember that they can’t solve the protagonist’s problem. They can give the protagonist a push in the right direction; they can nudge; they can remind; they can inspire. But they shouldn’t wave a magic wand and make everything all right. For Dorothy, help comes in the form of Glenda the Good Witch, who reveals a secret: The ruby slippers have the power to carry her back to Kansas. All Dorothy has to do is say, “There’s no place like home”—with feeling, mind you—and she’ll be back on the farm with Uncle Henry and Auntie Em. Dorothy’s problem isn’t resolved, however, until she applies this information internally. At the beginning of the story, she wanted to be anywhere but on the farm. Now she has to affirm that the farm is where she wants to be. Her hidden need—to find a place to call home—has been met. In Mostly Martha, the bleakest moment arrives with Lina’s father, Giuseppe. He is a good man, and Lina seems to accept him. But after waving good-bye, Martha goes home to an empty apartment and realizes that she is not happy with her controlled, childless life. She goes to Marlo, the Italian chef she has also begun to love, and asks for his help. Martha realizes that her old life was empty—she needs Lina in her life, and she needs Marlo. So she and Marlo drive from Germany to Italy to fetch Lina and bring her home. You may be hard-pressed to cite the lesson you learned from the last novel you read, but your protagonist needs to learn something. This lesson is the epiphany, a sudden insight that speaks volumes to your character and brings them to the conclusion of their inner journey. James Joyce popularized the word epiphany, literally the manifestation of a divine being. (Churches celebrate the festival of Epiphany on January 6 to commemorate the meeting of the Magi and the Christ child.) After receiving help from an outside source, your character should see something—a person, a situation, or an object—in a new light. When the scarecrow asks why Glinda waited to explain the ruby slippers, the good witch smiles and says, “Because she wouldn’t have believed me. She had to learn it for herself.” The scarecrow then asks, “What’d you learn, Dorothy?” Without hesitation, Dorothy announces that she’s learned a lesson: “The next time I go looking for my heart’s desire, I won’t look any farther than my own backyard.” She has learned to appreciate her home, so even though she is surrounded by loving friends and an emerald city, Dorothy chooses to return to colorless Kansas. She hugs her friends once more, then grips Toto and clicks her heels. Every story needs the fairy-tale equivalent of “and they lived happily ever after.” Not every story ends happily, of course, though happy endings are undoubtedly popular. Some protagonists are sadder and wiser after the course of their adventure. But a novel should at least leave the reader with hope. The resolution to Mostly Martha is portrayed during the closing of the film. As the credits roll, we see Marlo and Martha meeting Lina in Italy; we see Martha in a wedding gown (with her hair down!) and Marlo in a tuxedo; we see a wedding feast with Giuseppe, his family, and Martha’s German friends; we see Martha and Marlo and Lina exploring an abandoned restaurant—clearly, they are going to settle in Italy so Lina can be a part of both families. In the delightful final scene, we see Martha with her therapist again, but this time he has cooked for her and she is advising him. Your story should end with a changed protagonist—he or she has gone through a profound experience and is different for it, hopefully for the better. Your protagonist has completed an outer journey (experienced the major plot events) and an inner journey that address some hurt from the past and result in a changed character. Now that we’ve reached the foot of our story skeleton, we’re finished outlining the basic structure. Take those major points and write them up in paragraph form. Once you’ve outlined your plot and written your synopsis, you’re ready to begin writing scenes. Take a deep breath, glance over your skeleton, and jump in. Taken from A Novel Idea by ChiLibras. Copyright ©2009 by ChiLibras. Used with permission from Tyndale House Publishers. All rights reserved. I am extremely excited about this book. If you are at all interested in the creative process and business of novel writing, then this book is a wonderful resource tool. It is jam-packed with an abundance of information, ideas, and advice. It's a must-have for aspiring authors. For those who are veteran authors, it's for you too because we all could use reminders of the process and find inspiration from other authors' ideas about writing. I grabbed this book as soon as it came in the mail from Vicky Lynch and Tyndale Publishers, scooped up a couple of highlighters and dug in. It went beyond my expectations addressing special issues with Christian writing as opposed to secular writing. *What Makes Christian Fiction Christian? There are also great suggestions on establishing a writing routine, marketing, and breaking into the publishing world. With so much to consider beyond the creative side of novel writing, it's nice to have a helping hand from authors who want you to succeed. In my book, A Novel Idea is a ten out of ten stars.